Congratulations on your engagement fellow cruise ship lover! Either that, or you are a first time cruiser who is entertaining the idea that getting married on a cruise ship for a destination wedding would be absolutely fabulous. Sailing the high seas, a warm tropical wind in your face and the vibrant beat of the DJ playing tunes on deck, whilst you sip a cold beverage and snuggle up to your new spouse in a comfy wicker pod chair — sign me up!! If that sounds like your little slice of paradise, but you aren’t quite sure where to start, not to worry. We’re here to help you sort out a few planning issues in this article. Question: How many people do you want onboard sailing with you? Answer #1: Just for Two – An intimate cruise elopement would keep prices down and ensure a relaxed vibe. Do what you want when you want, without the pressures of appeasing or entertaining guests. You can also opt for a cruise send-off wedding, held at the departure port of the cruise. This option combines the intimacy and reduced price of the previous option while also involving more family and friends. Answer #2: A Family Affair – Taking your family and friends along with you on the cruise is possible. You can choose to say your vows at a chosen port on the ship’s itinerary. This way, everyone gets to enjoy a destination style wedding, while the happy couple gets to enjoy the intimacy of their cruise without interruptions. The destination and length of your cruise are two critical components of planning a cruise wedding. Start by thinking about the style of wedding you want. If you imagine an intimate cruise for two, your length of travel is only limited by your budget. Getting married on the cruise ship with the whole family or at an established port? You may want to limit your cruise to only 5 or 6 days. That way everyone can take the necessary time off work to travel and cruise with you. Combine your travel season with your cruise length and you should find a few different options that work for you. When choosing a date for your destination cruise wedding, consider booking in the shoulder season just before or after peak season. The weather will likely be as nice as the high season, and your tickets may be less expensive. If traveling with a group, you will also have a better shot at getting the perfect cabin configuration for your group. Picking a date for your destination cruise can be quite the chore. It is difficult to pick that perfect calendar date so that the people you invite are able to take time off work, schedule what to do with the kids, set aside a budget, and generally go on a vacation. Someone you really want at your wedding may potentially miss out. But, don’t let that stop you from going ahead. Try to compromise and pick a date that works for all the people on your must attend list. Step 4: Which Cruise Line? Picking the right cruise line for your style of wedding is an important task. It really depends on the type of cruise you want for you and your guests. We’ve put together a quick guide to six popular and affordable cruise ship lines, many of which allow you to host a destination wedding at a port of call. Do your research and ask lots of questions. Don’t be afraid to reach out directly to the cruise ship companies and dig into the specific wedding packages. Also, try browsing a website like Cruise Critic. They have additional guides and reviews of both cruise lines as well as individual ships. What’s also great is the message board forum they host on their website, where real couples and fellow cruisers interact by posting questions and answers. It is an invaluable source of on-the-ship information and tidbits that you may not find anywhere else. We’ve successfully used Cruise Critic in the past when planning and taking our own cruises. Just like any other social network, follow the rules and etiquette and you’ll be fine! We’re currently working on a complete guide to booking your wedding cruise. In the mean time, we will say that our past experiences booking a cruise vacation using online platforms have been easy and hassle free. Type the search term “book a cruise online” and you’ll find CruiseDirect near the top of the search results. As a leading online cruise travel company, they’re dedicated to providing their customers with access to great deals on cruise vacations. We love the variety of cruise companies they have on offer as well as their reputation as a highly rated cruise company. We’ve used this company several times to book cruises including our mini-moon cruise after our wedding. Their warm and friendly customer service agents have never let us down. We love keeping track of last minute discounts by using the 90-Day Ticker feature. While we don’t often avail of the deep discount prices (up to 80%+ off!!! ), it is fun to browse and dream about sailing the open seas again. One of the most trusted names in online travel booking, we’ve used Travelocity to book hotels and car rentals in the past with great success. The selection of cruise packages includes well known brands like Celebrity Cruises, Holland America, and Princess Cruises. There are benefits to booking your cruise as a group. Cruise lines offer various savings and deals for groups, especially if traveling for a wedding. Deals can include a free stateroom for the bride and groom, an onboard private reception area, dinner seating arrangements that seat your group together, free cocktails, and other welcome gifts for your wedding party. Expect that some people won’t be thrilled with the idea of a destination wedding for a number of reasons. And that’s okay! If it’s what you want then go for it. Just know that it is an expense that some may not be able to afford, or simply don’t enjoy cruising. You may receive less save-the-date cards back than you expected. Whether you send cards out yourself or use an all-inclusive service, the main thing to keep in mind is that you want to have the people who matter most beside you on your big day. 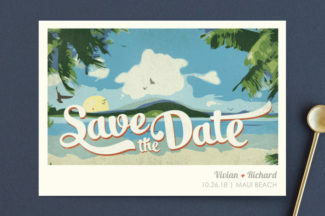 If you need a little etiquette refresher, here’s our article on how to address your save the date cards here. Making a wedding website is a fun and simple activity nowadays, thanks to the modern necessity of being online. Look for a service that lets you drag and drop elements you want into your site, at whatever budget rate you have. These range from free DIY versions to more expensive options that set up the perfect site for you. Be sure to share details on how to make reservations and other important info. We reviewed one of the most popular wedding websites (Minted), so go check out our in-depth review here. Photographers are skilled professionals that make your wedding the event you’ll remember the rest of your life. The ship package you choose may provide you with a skilled wedding photographer who already knows all the best photo spots around the ship or at your chosen venue. If you are looking to save money, more modern options of sharing a wedding hashtag, curating group videos via social media, or letting a friend or family member be the designated documentary specialist are all budget friendly. Many cruise ships offer a registry service as part of a wedding package. Ask ahead if that interests you. This allows gifts to be added on board or even let guests pay for the couple’s amenities on board. What kind of registry gift giving can you expect from a cruise ship? International laws and special circumstances mean you will need to be on top of your game when it comes to getting a marriage license for a cruise ship wedding. Make sure you get the license with plenty of time left ahead of your departure date. You can always have a legal ceremony before or after the cruise if you are worried about the complexity of it on board. 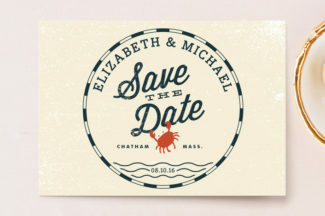 Invites for a ship wedding are going to look similar to an ordinary invite with a few exceptions. Make sure to include directions to either the dock or the meeting point for departure. If your wedding is taking place in a port of departure, you will want to mark a time that allows people to get to the ship in time for the ceremony. 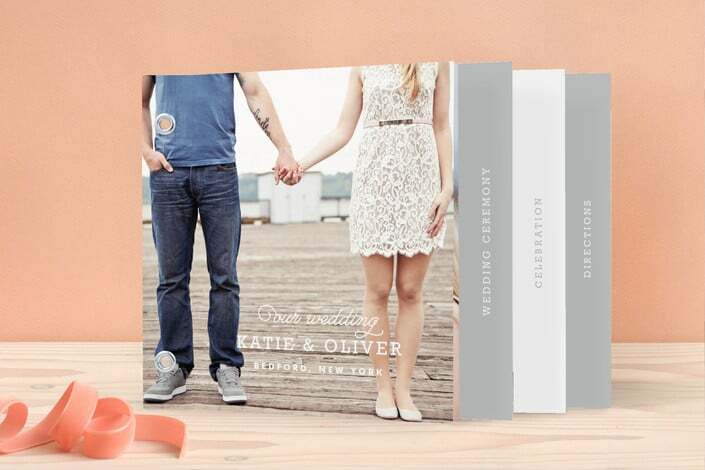 The above Minibook invite by Minted is a wonderful wedding invitation for a destination or cruise ship wedding that might have a lot of details to pass on to guests. Don’t forget to make note of any special circumstances your location might call for — no heels at a glacier ceremony would be a good tip to pass on! Some cruise lines offer rentals for things like tuxes and bridesmaid dresses. If you don’t have time to secure those items ahead of time, or you don’t want to rent them from a shop for the duration of your cruise, this might be your best option. This will also free up space in your luggage. Flying to your cruise ship departure destination? Be sure to read our guide to packing and folding your wedding dress. The planning is done for your dream destination wedding on a cruise ship! Now it is time to get out your calendar and count down the days until you too are popping the champagne and sipping a Bahama Mama on the lido deck! !